Jakarta (ANTARA News) - Jakarta, the capital and largest city of Indonesia, looks like a flower that attracts bees. Like many of the world`s capital cities, people from across the archipelago migrate to Jakarta for employment and for a better life or better job. Jakarta is a special city with full of expectations for those wishing for success and a better future. Jakarta also offers high salaries and job opportunities. As a result, the city`s migration rate remains high. Based on data of the Central Statistics Agency (BPS), in 2015, the population in Jakarta reached 10.18 million people. In 2016, it rose to 10.28 million people, and in 2017, it increased to 10.37 million people. Over the past two years, the population in the capital city had increased by 269 people every day. 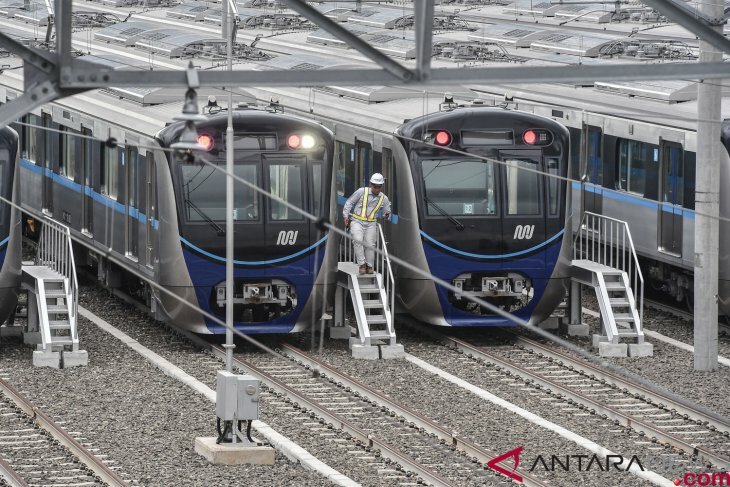 The BPS also revealed that 1.38 million commuters travel from the outskirts of Jakarta, comprising the cities of Bogor, Bekasi, and Depok in West Java and Tangerang in Banten, to the capital. As a metropolitan city, congestion has become a common sight in the capital city, particularly on weekdays. According to 2017 INRIX Global Traffic Scorecard, Jakarta was ranked the city with the 12th worst traffic in the world. The contribution to traffic density is still dominated by private vehicles, both two-wheeled and four-wheeled. The increase in new vehicles in Jakarta reaches 1.5 thousand vehicles every day, according to data of the Tax Office. Following this, Jakarta government has made various policies to reduce private vehicles, starting from the 3-in-1 traffic restriction policy implemented on main streets, increasing the number of buses in TransJakarta fleet, and progressive taxes to the latest vehicle, and the odd-even policy. However, the congestion still becomes a scourge for the citizens who prefer to use private vehicles rather than public transportation, as it is considered to not provide comfort and convenience. The congestion, especially in business centers, affects the atmosphere in the capital city. The Meteorology, Climatology and Geophysics Agency (BMKG) reported that air pollution had increased during rush hour on weekdays. Head of Air Pollution Information Subdivision at BMKG Suradi stated that there was a correlation between the size of the city and the pollution itself. In 2015-2018, measured from particulate matter less than 10 micrometers in diameter (PM10), air pollutants showed an average of above 100 micrograms per cubic meter, but it is still below the threshold of 150 micrograms per cubic meter. If measured by time, the highest concentration of PM 10 occurs at 00.00, 95 micrograms on an average, and the lowest is 54 micrograms at 10:00 a.m. local time. Meanwhile, based on the month, June became the peak of the high concentration of PM 10, reaching 107 micrograms because it was the peak of the dry season. There are more pollutants in the dry season than in the rainy season due to rain wash. Measured from particulate matter less than 2.5 micrometers in diameter (PM 2.5), air pollutants in Jakarta are still below the tolerable threshold of 65 micrograms per cubic meter. Data measured during 2015-2018 showed that the air pollutant level was still below 45 micrograms, and the highest recorded on Friday reached 44 micrograms. Friday became the most crowded day of traffic around the suburbs of Jakarta. Based on data, he concluded that the pollutants would increase in places where human activity was high. Based on the monitoring of air quality by Greenpeace since January 2017 in 21 locations in Jabodetabek (Jakarta, Bogor, Depok, Tangerang, and Bekasi), the air quality in Jabodetabek has reached an unhealthy level for humans. The data show that the air quality in Jabodetabek was not healthy, pointing to the levels of dangerous small particles known as PM 2.5, which are the WHO`s standard of 25 micrograms per cubic meter. The condition will cause more serious health conditions for vulnerable groups, such as children, pregnant women, and the elderly. Long-term exposure to air pollutants such as PM2.5 can cause acute respiratory infections and lung cancer, especially for children. In addition, PM 2.5 could increase levels of toxins in blood vessels that can spur strokes, cardiovascular disease, and other heart diseases, as well as endanger pregnant women. People expect good air quality to support their daily activities. One of the efforts made by the government to increase the quality of air is by building Mass Rapid Transit (MRT) system. The MRT is expected to reduce congestion in the capital. The decline in congestion would reduce air pollution. The MRT is also expected to encourage more people to shift from private vehicles to using public transportation services. Executive director of the Committee for Leaded Gasoline Eradication (KPBB), Ahmad Syafrudin, remarked that the 16-kilometer phase 1 of the MRT, from Lebak Bulus in South Jakarta to the Hotel Indonesia (HI) traffic circle in Central Jakarta, could reduce emissions to 85,680 tons of carbon dioxide per year. The figure is obtained by taking into account the carbon dioxide emissions from 175 thousand people who cross phase 1 of the MRT. Some 175 thousand people who cross phase 1 of the MRT contributed 171,360 tons of carbon dioxide per year. Around 64,260 tons of carbon dioxide came from motorbikes and 107,100 tons of carbon dioxide from cars. Hence, the MRT becomes a new hope for people who want to breathe cleaner air and enjoy the blue sky in Jakarta.